Books for Rayyan | escaped. If there's one thing I take pride on, it's my books. So naturally, when Rayyan was born, I yearn for him to grow up loving books. Every time we go to any bookstore, I'd make sure we buy a number of books for him - regardless how little our knowledge is when it comes to books for babies/toddlers. So far, he seems to love them - keeps asking us to read them to him over and over again, which I take as a good sign. Then I discovered Hello Genius books. Impressed by how they've got manners' pack and some other book sets, I looked them up online. Rave reviews, no surprise - parents actually worship this brand, citing how their kids learn about manners at such a young age by reading the manners' pack series, and how impactful the pictures are to the kids. According to them, it's the BEST book sets for young kids. After looking them up online, I realized in Malaysia only Kinokuniya carries the range. (Amazon doesn't ship to Malaysia). So one day, during lunch time, I went to Kinokuniya and looked for the books. 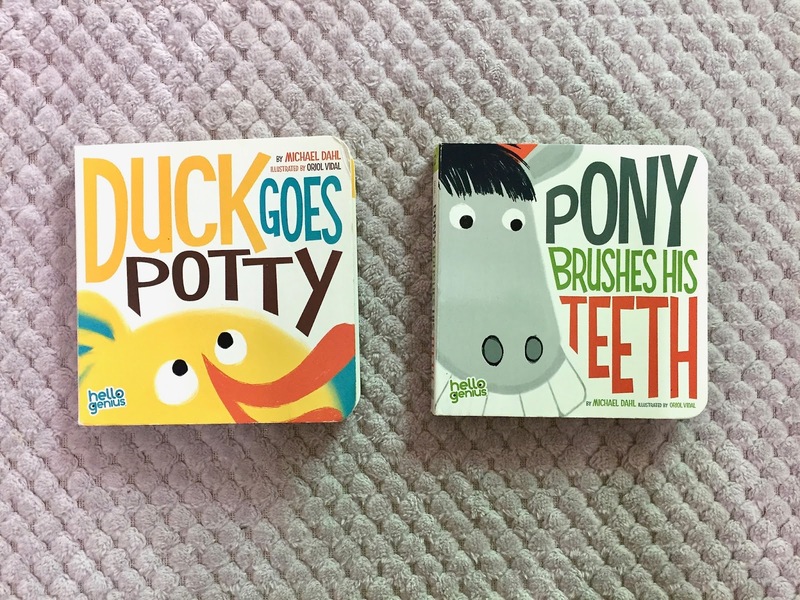 For kids' books, they sure don't come cheap T.T But I bought 3 of them anyway - Duck Goes Potty, Pony Brushes His Teeth and Little Elephant Listens because he loves animals and those were among the only ones available at the store anyway. So, a month later, verdict : Rayyan LOVES Duck Goes Potty. I'm not sure if it's the storyline, or the catchy phrase, or the vibrant graphics - it's the one book he'd hand to us every night to read. Little Elephant comes a close second and Pony came in last, which I suspect because the storyline (teaching kids how to brush his teeth) isn't amusing as the Duck Goes Potty story. The hard pages of the books are quite sturdy, too compared to the other books I've bought - mainly the reason why the higher price tag, I think. I'm looking forward to the time when Rayyan is old enough for us to teach him the potty stuff, cause then the book will really come in handy.